Final Goodbyes . . .
Jan and I did much of nothing today, with, as usual, Jan reading and napping while I worked on website stuff. But that finally ground to a halt when I got to a point that I need input/photos/content from the client before I can proceed, something that’s pretty standard with website work. I sometimes refer to getting input from a client to pulling teeth. At least it’s not my teeth. Earlier today Jan took Landon and Gwen over to the nearby Main Event Entertainment Center to spend the afternoon, ending up at Baskin-Robbins. Sounds good to me. At 3:30 we headed into the Katy area for a stop at Sam’s Club for a couple of prescriptions and some other stuff. 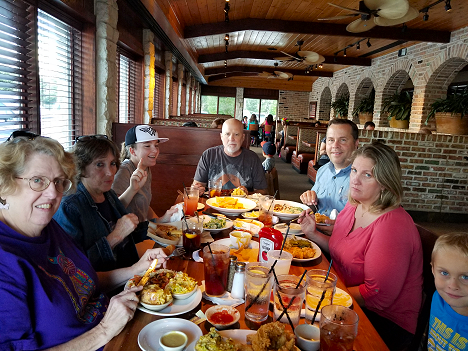 Then it was on to the nearby Cheddar’s to meet up with Jan’s sister Debbie, her granddaughter Gwen, and husband Jim. And of course, Lowell, Brandi, and Landon. Jan calls this Brandi’s ‘pissy’ face. Everyone else in Debbie’s family has already headed back to Illinois. We spent about two hours at dinner before finally saying goodbye and getting in our hugs. We’ve already set another reunion, this time up in Illinois, for two years from now. Looking forward to it already. Hopefully this will eliminate the dead air space and improve the air flow around the condenser coil. I hope this will fix the problem of our AC working just fine when we’re sitting still, but not when we’re traveling. If I can’t find plastic that I like I may just leave the cover off for the trip back to Lake Conroe this coming Sunday, assuming the weather looks good.